Teenager Casey Newton spends her days in school listening to her teachers tell her over and over that the world is doomed, that war, injustice, and climate change will be the end of us, but never answering Casey’s question of how we fix it. She spends her nights breaking into NASA’s Kennedy Space Center in order to sabotage the demolition equipment poised to destroy one of their launch pads that is no longer in use, hoping to save both the space program that has inspired her as well as her dad’s job at NASA. Things start to change when, upon having her possessions returned to her after being arrested for trespassing, she’s given a mysterious pin that, when touched, seemingly transports her to another world. The vision only lasts a brief while, but it shows her a future where humanity is united in the pursuit of expiration, led by dreamers and optimists for whom Enstein’s quote “Imagination is more important than knowledge” is a guiding principle. The pin’s vision fades, and Casey is left with the unyielding need to find out more. Her quest will lead her from her home to a bizarre science fiction shop to a mysterious young girl who knows more than she’s letting on and finally to Frank Walker, who might have been able to take her to this Tomorrowland if only he hadn’t given up a long time ago. Frank has had his own journey, that started back in 1964 at the New York World’s Fair when he was 11. Frank took a jet pack of his own design to the fair, hoping to win an award for his invention, but was discouraged when David Nix, a judge for the competition, turned him away when Frank revealed that the jet pack doesn’t completely work. However, Nix’s assistant, a girl Frank’s age named Athena, gives him a mysterious pin in secret, which leads him not to a vision of Tomorrowland but to the place of dreams itself. Now, years later in the present, Frank has lost hope, sitting and watching the world slowly crumble away, powerless to stop it. 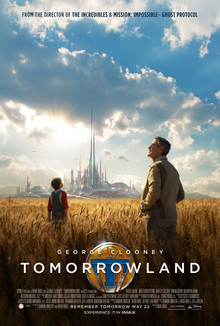 Can Casey help him find his optimism, and can be in turn help her find Tomorrowland? Can the world be changed before it’s too late? Tomorrowland is a movie full of big ideas, about the state of the world, how it got there, where it’s going, and how we can change our course. Director Brad Bird, along with writers Jeff Jensen and Damon Lindelof, has crafted something increasingly rare in Hollywood: a movie with a message. It’s an important message, not just about the future, but about the sorts of stories we love to tell (it’s also the sort of message that is too tied into the story to discuss without spoiling the film, so look for a deeper, spoiler filled analysis in the coming weeks), but the message might also be the film’s biggest weakness when it comes to appealing to the general populous. Your tolerance for Tomorrowland is most likely directly proportional to you williness to be preached to. I can easily see some people being bored or even offended by the movie, particularly its unambiguous and occasionally accusatory message. Of course, it’s clear message is one of the reasons I completely adored Tomorrowland. It takes a high level of boldness to make a film of this sort, and I fully applaud the result. Of course, it helps that the movie has so much more going for it. Britt Robertson is perfectly cast as Casey, bringing the perfect balance of optimism with just a dash of weariness from having that part of herself be constantly criticized and besten down. George Clooney presents the other side of the coin, and he gives Frank just the tiniest spark of potential hope underneath the bitterness and resentment of years of disappointment. Newcomer Raffey Cassidy frequently steals the show as Athena, a girl with a secret, a mission, and just a hint of mischievousness, while Hugh Laurie, Tim McGraw, and Keegan-Michael Key show up in meaningful roles. The cast works remarkably well together, helping to sell the more fantastic elements of the story while driving home the film’s message without overselling it. It also helps that the film is often gorgeous and fascinating to look at. The level of thought and planning that has gone into the design work for Tomorrowland is truly impressive. It’s hard to make a vision of the future that doesn’t immediately feel dated, but the Disneyland-inspired retro-futurist style gives Tomorrowland a timeless quality. Combined with some exceedingly creative action set pieces and clever and often very funny writing, the result is a film that feels fresh but familiar. None of that changes the fact that a good number of people simply won’t like Tomorrowland. It’s definitely not a movie for everyone, despite the intentions of the storytellers. Some will be offput by either by the film’s message or simply by it having any message at all, while others will be disappointed that there’s far more dialogue and mythology than action, and still more will simply dislike the fact that it tells the story of a smart, strong young woman who is interested in science and space exploration and who has no romantic interest in the film at all. But Tomorrowland is one of those rare movies that feels like it was made just for me. We all have them, the film’s that feel like you were sitting there in the production meetings, pitching them the script yourself and checking off the boxes to make sure they included everything you wanted. It makes it hard to even describe why you love that particular film so much, other than to say that it fits you like a glove. Tomorrowland was one of those movies for me, and while I’m thrilled I’m also disappointed that it probably translates into alienating other large chunks of its potential audience. But I’m sure I’m not alone, and that there are others out there who feel the same as me: that Tomorrowland is a bold, original, important work of art. After all, I can’t be the only Optimist out there, can I? This entry was posted in Movie Reviews and tagged brad bird, Disney, Film, Film Review, Movie Reviews, Movies, Tomorrowland by lovepirate77. Bookmark the permalink. The two-wolf story has haunted me lately. I have heard it from a random customer (a kid doing an art project), I’ve heard the story before, and now in this film. It’s a great image, one that comes from Native American wisdom… a people who have seen the apocalypse, and survived it. Sometimes you have to drag out that theme, that wisdom in the story, and actually mash people over the head with it. This film does that well, and I don’t think being more subtle would have helped their cause. Can’t wait for the DVD so I can pan through the sci-fi shop and catch all the goodies. I was there in 1964 at that world’s fair. I rode that “It’s a Small World” ride, though I never found the secret door. I can still hear the squeaky voices and see the dancing dolls, primitive by today’s standards, but pretty impressive for that pre-Star Trek time. Somewhere there is a picture of me, annoyed in a dress, in front of the big skeletal globe. A couple years later, in 1966, I was swept up into Star Trek: TOS, which also showed us a positive view of the future, despite the continuing obstacles Life has to climb over on the way. In that same time period, Jacques Cousteau opened up the oceans to our eyes, and showed us the possibilities there. And in 1969, that moon landing, all of us glued to our TVs, amazed at what we were seeing. In 1977, Star Wars exploded on the silver screen, and despite its title, showed us that it was still fun to run around in space. And Indiana Jones showed us it was fun to explore the past. And Jurassic park… uh, not sure, maybe that was the beginning of the apocalypse. All in all, my childhood was rife with optimistic views of the future, of science, and of our possibilities. The pendulum has swung back toward the grim, the “realistic”, and the apocalyptic now. It’s great to see a film like Tomorrowland break this cycle. i have to also add films like (well, all of Pixar) Cinderella, where an optimistic, essentially Good character changes not only her own fate, but that of others. I would have seen the film anyway, but this one made me more excited to see it, and to celebrate the brilliance of Brad Bird, and all the actors who made this jet pack vision fly.